The proprietary designed and developed Sentinel Amplified Loudspeaker Controllers are the “engine” behind every Alcons system and are designed to get the absolute maximum performance out of the pro-ribbon systems. The ALC Sentinel features a powerful 4-channel DPS-based controller with ClassD amplifier stages. The 4 individually addressable inputs accept analogue or up to 192 kHz digital AES3 signals, that are up/down sampled to 96 kHz. by the custom high-end sample rate converters. The future-upgradable powerful DSP engine enables minimal latency during processing of even the most complex (IIR, FIR) algorithms. Features include 6-band (shelf/pass/parametric) equalising per channel, delay, factory presets for all systems and system configurations, user-presets, event-logging and system feedback. A Linux-based micro-computer “oversees” and controls all processes. The full-colour TFT touch screen and the multi-colour LED illuminated encoder in combination with tab-based menu structure offers intuitive control over the amplifier and processor sections, while reducing the number of “wearable” components. The Signal Integrity Sensing™ circuit dynamically compensates the effects of long speaker cables; This results in a tight sub and bass response regardless of cable length or impedance (system damping factor of 10.000) and without the need for manually entering cable parameters. SIS™ also caters for futher reduced distortion (optimized cross-over drive).  The 4 patent-pending ClassD amplifier stages are 93% efficient and offer one of the lowest THD in the industry. Together with the 2 (redundant) switch-mode power supplies, the Sentinel10 delivers a total of 10.000 W. The modular design makes for easy “in-the-field” servicing and future upgrades. The Power Detection Circuit automatically select the correct operating AC current 115 V / 230 V and protects against overload above 400 V.
Individual Sentinels can be simply controlled through a VNC app. on any mobile device; More complex Sentinel clusters can be controlled via the ALControl™ Ethernet-based remote-control connection. Internal slots are available for optional Audio-over-network plug-in modules.